Lack of museum sites and facilities threatens many private collections. Richard Davis drove up and down the state of California in his brown pickup truck throughout the 1990s with a big marijuana stalk tied to its shell and a collection of informational displays plus a few historical artifacts, and setting up his Mendocino Mobile Marijuana Museum at hemp rallies, public hearings and, most famously, poised in front of a Madera courthouse where three men were on trial for planting industrial hemp in front of TV news cameras — more than a year before state voters legalized medical marijuana. Every day as the trial went on, the judge had to instruct the jury not to be influenced by his museum and not to talk about the case or read anything about the case that might be in the display. Davis wasn’t in Madera to talk about the trial but to make sure that everyone who walked by learned something about hemp and the founding of the American republic and how cannabis hemp could save the world. He continued to make and collect thousands of items over two and a half decades, including a warehouse capacity display of his cannabis museum in West LA that was open at irregular times, by the time he passed away. Now Richard Davis’ fabled museum truck has been lost and the rest of his collection sits in a storage locker with nowhere to go and no one to see it. Just before he passed away, Davis and his partner, Brenda Kershenbaum, called up long-time friend and fellow activist Chris Conrad who, along with his wife Mikki Norris, had toured the country since the late 1980s and given presentations with Davis, author Jack Herer, Cannabis Action Network, college hemp clubs and countless others. Davis asked Conrad to help preserve his collection and Conrad, who has curated cannabis museums in Amsterdam and Oakland CA and has his own collection, was quick to agree. Conrad is now on the Board of the 420 Archive, a non-profit organization, working with other well-known collectors Michael Krawitz Donnie Wirtshafter is on a quest for resources to try to capture, preserve and exhibit some of these lost treasures. 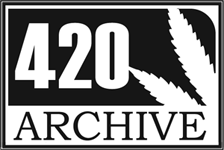 The 420 Archive is a grant, donor and volunteer supported non-profit organization that does other important work, including preserving cannabis archives and collecting personal oral histories of the cannabis outlaw community, medical marijuana patients, and the reform movement. For more information contact Tim Perkins or Joe Hoover.